Of course Dark Shadows had spooky sets and even spookier characters...but the background music on the show added an ever greater level of creepiness to the goings-on. And through the years a number of music-related collectibles have been released. 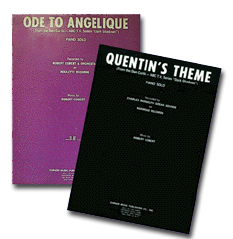 Sheet Music was sold for "Quentin's Theme," "Shadows of the Night" (which is really just "Quentin's Theme with lyrics), and "Ode to Angelique. 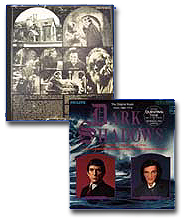 The sheet music for these pieces, as well as much of the rest of the music featured on the show, was reprinted in The Dark Shadows Music Book by Pomegranate Press in 1996. 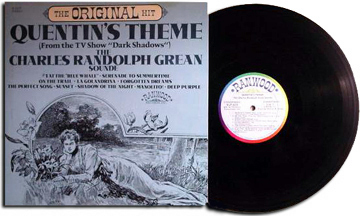 Several Dark Shadows-related singles were released, including "Quentin's Theme," "Josette's Music Box," "Barnabas Theme From Dark Shadows," a Nancy Barrett/David Selby duet called "I Wanna Dance With You," and even a parody called "Barnabas/I'm Bats About You." A number of Soundtrack Albums have been released over the years. The first volume came out in July 1969 and spent 19 weeks on Billboard's charts (peaking at number 18 in August). It features 18 cuts -- five of which are accompanied by dramatic narration by Jonathan Frid, and one of which features narration by David Selby. The back of the album sleeve featured several black and white images, and inside was a two-sided poster of Selby and Frid. 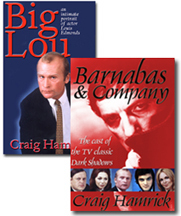 Later soundtrack albums were released in the 1980s and '90s and are currently available from MPI (mpimedia.com). One of MPI Video's compilation tapes contains music highlights from DS. 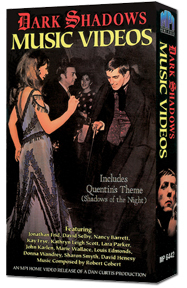 The Dark Shadows Music Videos VHS includes everything from the ghost of Sarah Collins and Maggie Evan's creepy duet of London Bridge to the Collins clan singing Happy Birthday to David. 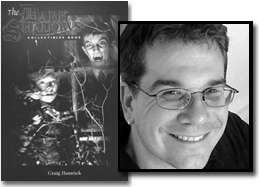 The contents of Dark Shadows Online are copyrighted by Craig Hamrick © 2006.